The other day, I read about how the new TED-Ed site was experimenting with ways to remix, flip and otherwise redo their own lessons and video content, and since I am curious about new tools, I dove in and gave it a try. The tool is set up around a video, but you have quiz questions that are set up (with video helpers if you get stuck), some open-ended discussion questions (or you can make your own, as I did), a space for additional links and resources, and a final thought. I found it incredible easy to use, and it seems simple to adapt for my own needs. Actually, the lesson I ended up creating is the second variation of a lesson I created around Shakespeare and insults — the first one had a word (ironically) that I wasn’t comfortable with in one of the quizzes, and you can’t edit a flipped lesson once you publish it to the site. So, I redid the whole thing. I’d like to invite you to give it a try. I’m still not sure if this is something I can use with my students (as I am still not sure of the whole flipped idea), but I am open to exploring it more and figuring that out. Certainly, the remix tool is easy to use, and looks great when you are done. And, I think you can even pull in YouTube videos and more as content to your lesson. 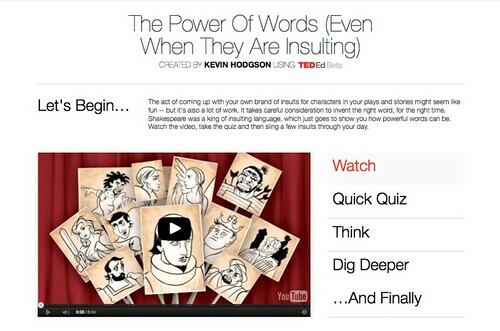 It’s a great way to curate information in a TED package, and if viewers are logged in, you can track their stats as they move through your lesson. (The need to log in is what would stop me with my students, since they do not have their own email accounts). Want to see my lesson, The Power of Words? Any feedback would be helpful.